Today we will talk about how to attract Chinese tourists to your business in Europe. According to an article by the Diplomat, recent predictions have suggested that by 2022, China will see its middle class swell to around 630 million people. Chinese tourists were the biggest spenders in 2016, splurging a whopping $274 billion on their travels, especially in popular destinations outside of Asia such as the UK, France, Italy, and Germany. They make up the largest share of all international tourists, and on average spend more money than tourists from any other country. So what does it all mean for Europe, and France in particular? Let’s dig a little deeper and see how your business can attract Chinese tourists today. Last week, an English restaurant found itself in the headlines. 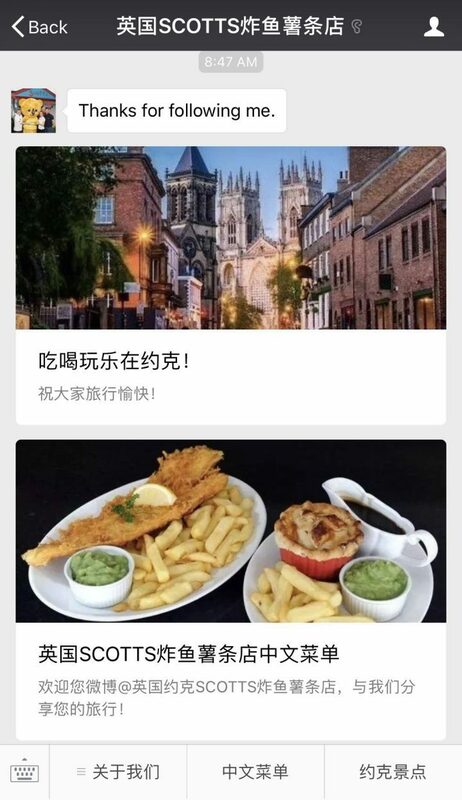 Many British news outlets, including The Guardian told the story of a fish and chip restaurant near York successfully taking advantage of the digital age and Chinese Social Media Channels to boost their business. 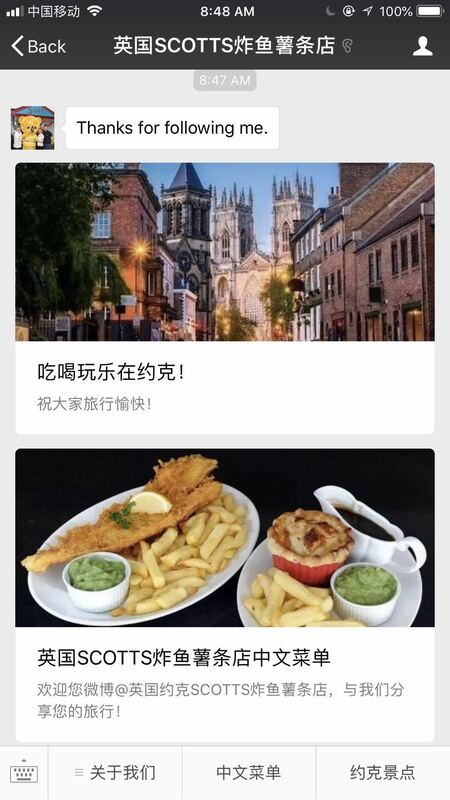 By simply translating their menu into Chinese and publishing it on their Official WeChat account along with a few other articles about local tourist attractions, an “about us” page, opening times and contact information (all in Chinese), they have been able to pull in coachloads of hungry Chinese tourists visiting England’s famous landmarks. Promoting the restaurant on Weibo (China’s twitter equivalent) has also added to its success. As a result, the famous dish, whose popularity had been dwindling among England’s younger diners, is now booming again thanks to Chinese social media, and buoyed of course by President Xi Jinping’s visit to the UK in 2015, when he sampled the famous dish with then Prime Minister David Cameron. To find out more, the Weibo account for Scotts fish and chip restaurant can be found here. This example shows how even small businesses in Europe can get ahead when it comes to attracting tour groups from China traveling around by coach. This is a near perfect scenario for roadside restaurants. However, attracting tourists traveling in large groups may not be the main goal if you run a top-end luxury goods business or exclusive hotel, as it is no secret that the wealthiest people do not travel in large groups on coaches, and prefer to travel independently. They also often prefer to make their purchases privately away from large crowds. There are several ways to attract free independent tourists (FITs) from China, which we will talk about in detail in this article. But! Before you try to attract all (or even a tiny number) of these visitors to your store/hotel/other business, it is important to find out a little more about their lifestyles and habits in order to understand their expectations and cultural differences, and make them realize that not only do you exist, but you also have something to offer them. So, what do you need to be aware of when catering for Chinese tourists in Europe/France? Here are a few actions for you to consider taking to make your restaurant, store or hotel a big hit with Chinese tourists. To attract Chinese tourists one needs to understand their behaviour. Chinese tourists are very easily influenced by the opinions of others. When traveling, they refer to their own “review and advice tools”, the king of which is Dazhong Dianping. Featuring similar functions to Yelp, it lists local retailers, restaurants, bars, cinemas etc. in China and abroad and it is the go-to tool for Chinese tourists. For example if a restaurant has a seemingly never-ending list of raving reviews on Dianping, the Chinese will flock there in their droves without any hesitation. On the flipside of course, a couple of bad reviews will put off many potential Chinese customers who will opt to dine somewhere with a higher rating. In China it is not uncommon to see two restaurants side-by-side serving the same type of cuisine, where one is completely empty and the other has crowds of hungry diners queuing outside for up to 1 hour for a table. This is the Dianping effect in full play. We will show you a step-by-step guide for this incredibly influential and powerful app and how it works in the next article. We will also fill you in on how you can get your business listed on Dianping so that you don’t miss out, and also how you can post your first reviews on Dianping and other Chinese social media platforms. 2. Know the key dates of the Chinese Holiday Calendar. In this case – ignorance certainly isn’t bliss! Holidays are a very important part of life in any society, and in China it’s no different. 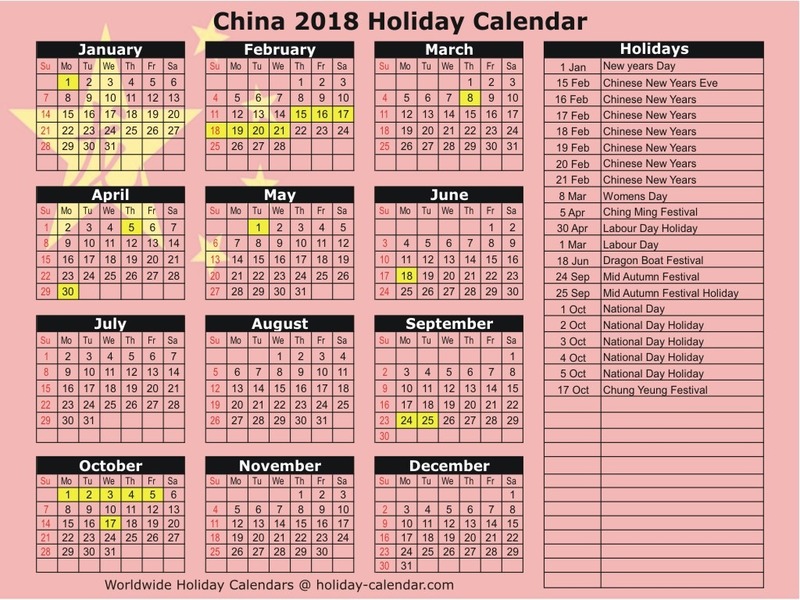 One very important thing to be aware of is that the Chinese holiday calendar has almost nothing in common with the European and American calendars. As a non-Christian country, there are no Christmas holidays, Easter breaks, or those countless ‘ponts de mai’ the French are famous for. Instead, the main two holidays are ‘Golden week’, which follows China’s National day at the beginning of October, and the week during the Chinese New Year which falls between mid-January and mid-March. This break is based on the Lunar calendar, which is why the dates will be different each year. For many Chinese people, the two periods mentioned above are the only opportunities they will have to take a holiday during the whole year. As a result, tourist spots inside China are completely overrun with visitors at these times, and more and more Chinese tourists are therefore looking beyond their borders for new and less crowded experiences. Knowing your dates will make it easier to plan your campaigns and will attract Chinese tourists when they are nearby! Making customers comfortable is one of the ultimate goals of any business. However here, that doesn’t necessarily mean that Chinese customers need to be served by one of their own (even though this could go a long way in some sectors). Nevertheless it is certainly worth considering how you can ‘localize’ and adapt your services to suit your new target customers. Your localization strategy may consist of translating your menu and door signs, adding a few cultural-friendly dishes to your menu, providing photo opportunities (for restaurants), installing Chinese TV channels, providing advice, warning signs, and other information written in Chinese, access to hot drinking water and familiar breakfast options, and providing your staff with cultural training (especially for hotels). Paying attention to the details above and many others (such as being listed on Dianping of course), will greatly increase the chances of satisfying your Chinese customers, and is sure to do wonders for your popularity in the Chinese online world. When users make a payment with either Alipay or WeChat Pay abroad (the two favourite Chinese social media platforms that introduce payment systems to Chinese people), the customer always pays in Chinese Yuan (RMB), while the stores receive the payment in their local currency. This means that it is not necessary for non-Chinese businesses to deal with foreign exchange, as the revenue is sent to the business’s usual bank account. Therefore, this is a great opportunity for retailers in Europe who provide mobile payment solutions to market themselves and attract Chinese tourists without making major adjustments to their payment systems. Recently, WeChat Pay, the online payment giant from China created by Tencent in 2011, started introducing its instant payment service in France through cooperation with French bank BNP Paribas, making it available to French retailers, to compete with its Chinese rival Alipay from the Alibaba Group, which already has a decent presence in France, meaning that French retailers are now able to target over 938 million monthly active WeChat users. And we’re not just talking large department stores here. 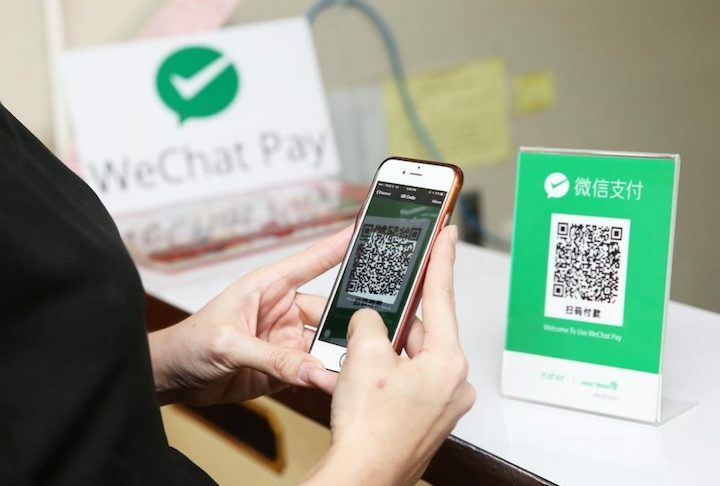 Any shop, restaurant or bar can install WeChat’s QR code payment system, a favourite among Chinese shoppers, which, believe us, if you haven’t used yet is one of the most convenient things that has ever happened to humanity! By simply scanning your business’s QR code, your customers can pay in an instant using their mobile phones, and in their own currency. You then receive the payment to your business account in your own currency! Having a “WeChat Pay/Alipay” door sign will undoubtedly help you to attract Chinese tourists passing by and elevate you from your neighbours who are either still sceptic or simply oblivious to the WeChat/Alipay revolution. To help you through all the technical details of setting up this marvellous and business-changing solution, contact us right now! Partnering with Chinese tour operators is one of the most logical things to do in order to bring in more traffic. However, to ensure your business is also noticed by individual Chinese travellers, you need to make your name as visible as possible on Chinese social media. Having a listing on Dianping will of course help, but it’s not a ‘catch-all’ solution. To start getting noticed from the other side of the world, we have a few tips for self-promotion. For example, activating and feeding official accounts on Weibo (the Chinese social media platform equivalent of Facebook), and WeChat (similar to WhatsApp, Facebook, and Instagram, but miles better), and using Chinese influencers might just be what you are looking for. Chinese Influencers/KOL are developing faster than in the West, where most Chinese social media stars with more than 2 million real followers have already published books, created a brand or set up a few online stores. Chinese Travel Influencer Leila has built up an audience of 4.5 million followers on Weibo. She also published her first travel book in May 2018, speaking about her past travels and the role of women in modern society. Leila is an inspiring role model for young women. She has been through the difficulties of divorce, rebuilt her life, and emerged a winner. But in this booming KOL industry, it is not easy for someone new to the game to determine whether or not the followers of a KOL (Key Opinion Leader) are real, so it is recommended to consult a professional agency to avoid scams. Another issue of course is the language barrier. Not many Chinese influencers speak English (even in the travel industry). Agencies will also help you to determine which Chinese online platform is most suitable on which to promote your business. Want to learn more about KOL Marketing? Then click here! 6. Learn About Dazhong Dianping in depth and let your visitors know you’re on it! Knowing more about the people you are wishing to attract is one of the simplest routes to their hearts! Even a simple “Thank you” in their language will make a good impression, not to mention being present on popular apps like WeChat, Dianping or Taobao (China’s biggest online shopping platform). Having a Dianping sticker on a window of your restaurant/hotel will not hurt at all, and bringing it up during small talk is also recommended. Translated literally as “public commenting and review network” Dianping was established in Shanghai in April 2003 and is one of the most popular Chinese social media tools today. Dianping is China’s leading local lifestyle information and trading platform, and claims to be the world’s first independent third-party consumer review website. Dianping not only provides information services such as user information, consumer reviews and commercial offers and discounts, but also provides O2O (Online To Offline) trading services such as group purchases, restaurant reservations, takeaway services and electronic membership cards. 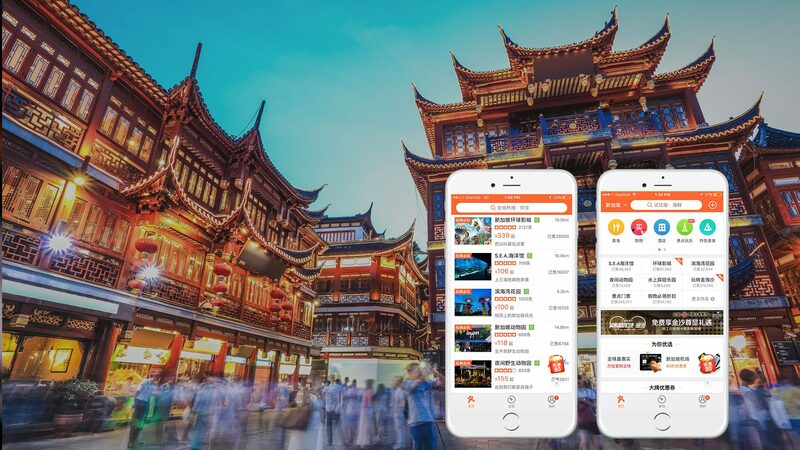 As of the first quarter of 2015, the number of active users of Dianping exceeded 200 million, including more than 14 million merchants, covering more than 2,500 cities across the country and nearly 100 popular tourist countries and regions such as the United States, Japan, and France. 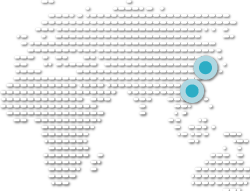 In addition to the Shanghai headquarters, Dianping has established branches in more than 160 cities including Beijing, Guangzhou, Tianjin, Hangzhou and Nanjing. Dianping has more than 15 billion page views (websites and mobile devices), of which mobile browsers accounted for more than 85% of the total, and mobile clients accumulated more than 200 million unique users. So far there are 750 Dianping registered restaurants and 1,000 hotels in Paris. Being listed here will definitely attract Chinese tourists from China and neighbouring destinations! WeChat Pay is not the only thing that has made WeChat so popular, the App started as a messenger platform with the option to have an online profile – a space to share pictures and links to music etc. Right now, WeChat is one of the most useful mobile Apps/platforms in China in which Mini-Apps can be built that will work as Add-ons for your WeChat App. So from checking the weather to making a doctor’s appointment, WeChat is here for you! Knowing that more than 900 million monthly active users are constantly searching for information, brands are creating their own Official WeChat accounts to ensure their brand’s voice is heard and recognized in Chinese social media. Brands update their visitors on news and promotions, and even create extra benefits such as WeChat membership cards and lucky draws. With all this in mind it would certainly be worthwhile to step into the WeChat game – even if you don’t plan on publishing that often. WeChat is one of go-to tools when one wants to attract Chinese tourists. 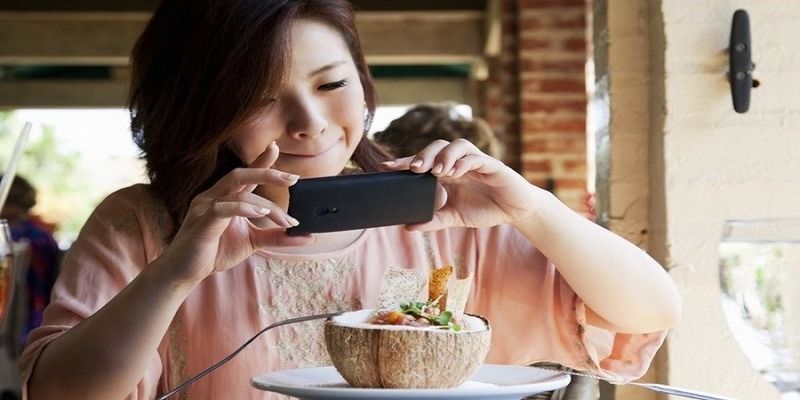 To attract Chinese tourists please consider new Chinese social media tactics. 2018 has so far been a year of video content. The technology now available supports many types of video, and recent studies have shown that video has an engagement rate at least twice that of photos. When it comes to the Chinese market, investing in video content can be done in various ways. There are a range of popular video apps and platforms that people visit to have fun, such as a unicorn DouYin (TikTok), which won the hearts of 1 billion users in just over one year. For a brand, one of the fastest routes to the top is by teaming up with a popular account which has a few million people following them already. Secondly, keeping in mind that most other social media platforms have released video options – one may consider cooperating with “more mature” KOL from Weibo, WeChat, Red, and some of the other platforms we talk about in this article. Most Chinese KOL do not speak English, and they work in different ways in relation to their Western colleagues, so we would recommend handing this task to a professional. But KOL/influencer marketing is a proven way to attract Chinese tourists to your destination! One of the biggest concerns among Chinese tourists during the past few years in France has been safety. Due to a spate of robberies, thefts and muggings, Chinese tourism decreased in 2015 and 2016. Even though the official authorities have taken serious action to prevent such incidents from occurring in the future, and despite the fact that things seem to be returning to less alarming levels, it is important to reassure visitors as much as possible by providing them with safety information, especially if your neighbourhood can be dangerous at times. In order to attract Chinese tourists, many hotels have already taken such measures. But do keep in mind that your English version may not be sufficient for your Chinese guests. This information can also be uploaded to your Chinese social media page, such as Weibo, WeChat account etc. 10. Read our article on how to use the favourite APP of Chinese social media – Dianping and what it’s all about!